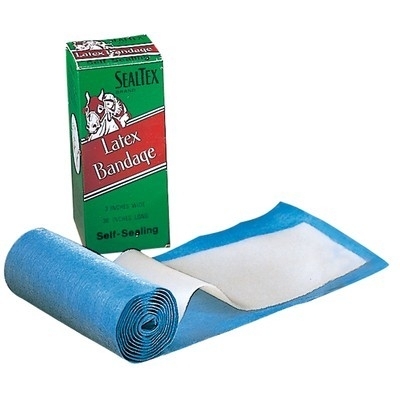 Latex Bandage is a self sealing bit wrap. Has lots of uses but in this country is used mainly to wrap bits. Safe and easy to use. Can be used on stainless steel bits for a soft cushion effect or on a plastic bit which has rough edges on it. Even used on the front of German Hackamore nosepieces. This is the only bandage that is completely unaffected by water. It doesn't have a weave or mesh to become clogged with mud and therefore absorbs no water. We tend to find that the Latex Bandage kept in a cold place goes hard, if this is the case just move it to a warm spot and it will soften. Due to the new postage terms this item has to go small packet even though it is a light item. It might be more cost effective if this item was purchased alongside a second item or to order two latex instead of one.